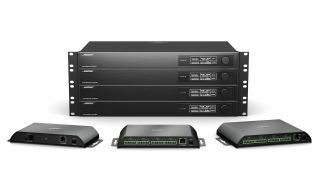 The What: Bose Professional is expanding its ControlSpace EX range with two new processors optimized for conferencing rooms (EX-440C and EX-12AEC) and a high-powered, general-purpose digital signal processor (EX-1280). The What Else: With an open-architecture, all-in-one design, the ControlSpace EX-440C conferencing signal processor facilitates high-quality microphone integration and audio processing for small-to-medium standalone meeting rooms. Various inputs and outputs allow for flexible configuration: four mic/line analog inputs, four analog outputs, onboard VoIP and PSTN, USB, Bose AmpLink output, eight-channel acoustic echo cancelling (AEC), and 16x16 Dante connectivity. With an open-architecture design, 12 acoustic echo cancellers (AEC), 16x16 Dante connectivity, and flexible signal processing, the ControlSpace EX-12AEC conferencing signal processor provides a robust expansion of control options and capabilities tailored for conference rooms using the ControlSpace EX-1280C processor—well suited for larger conference rooms, boardrooms, and any space where Dante microphones are employed for conferencing. With an open-architecture, single-rack-unit design, the ControlSpace EX-1280 is a robust digital signal processor equipped for general-purpose audio processing applications. Twelve mic/line analog inputs, eight analog outputs, Bose AmpLink out, and 64x64 Dante connectivity allow for flexible configuration and high-quality sound system control. The EX-1280 digital signal processor is designed for performance venues, places of worship, hospitality and resorts, and other spaces requiring intensive processing and scalability, offering increased functionality beyond the existing ControlSpace ESP engineered sound processor line. The Bottom Line: ControlSpace Designer software simplifies the setup process for all three processors with intuitive drag-and-drop programming and conference-specific software tools that help reduce installation time and on-site errors.These new models are compatible with Bose Professional’s line of Dante endpoints and end-user controllers—including wall-mount and mobile device control using ControlSpace Remote.